Liberty is brilliance in book form. Made up of three stories about three strong and brave women spread across time, Liberty will pull you in from chapter one and it simply won’t let you go. In 1472 France, war is coming to Jeanne’s village. They are outnumbered, and their weapons are inferior to their enemy’s. There are rules for women of this time — rules that prevent them from fighting — but Jeanne won’t stand by and let her home fall for the sake of some rules. 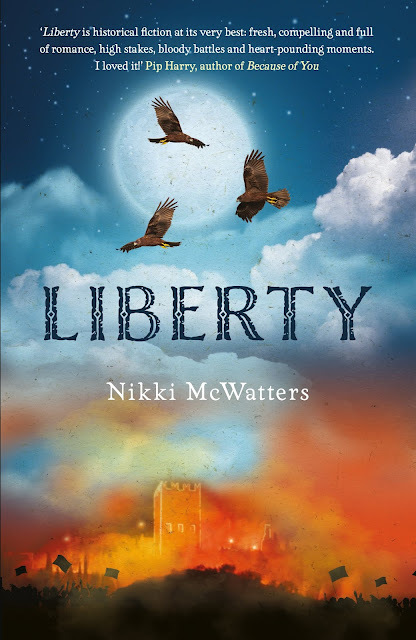 In 1797 Ireland, Betsy has joined the rebel army with her brother and the boy she loves most in the world. They want to stand up for their country. They want to achieve liberation from English rule. But what price will Betsy have to pay to get what she wants? In 1960 Australia, Fiona is starting university, but when young men she knows are conscripted to fight in the Vietnam War, Fiona’s whole world changes. She has to make tough decisions. She'll need to choose between doing what she’s expected to do and doing what she thinks is right. Each story is fiction but all are based on real times, real events and, for some of the stories, real women in our history who stood up and fought for what they believed in. The book alternates between the three stories one chapter at a time, but it is in no way disorienting or confusing. Author Nikki McWatters is a true wordsmith. Each character is rich and real, so it’s impossible to confuse them, and each chapter quickly pulls you into the story, grounding you in the events of that particular tale. Throughout history women have been up against it, but Liberty shows young readers that being female doesn’t mean you can’t fight for what you believe in. This is a brilliant book for young women (and men). It will ignite courage and inspire voices to shout out loud. But above all, it’s just great story telling. Each tale is exciting, thrilling and addictive. They are filled with explosions and marches, risks and sacrifices, friendships and forever loves. Woven through each story is a powerful element that binds each amazing woman together — a secret for each to discover and keep. It is this secret that connects Liberty to Hexenhaus, the book that came before it, and to Saga, the book that’s yet to come. Each book is independent and can be read alone, but all are connected in a very special way. And when you discover what the secret is, you’ll love these books even more. I highly recommend grabbing a copy of Liberty. It’s a thrilling and addictive ride, filled with deeply moving stories that will stay with you long after you close the book. You are most welcome, Nikki. We love your work. Ed.